Natures Plus Animal Parade Multivitamin & Mineral Liquid contains vitamins D3, K2, prebiotics & organic gold standard whole foods. 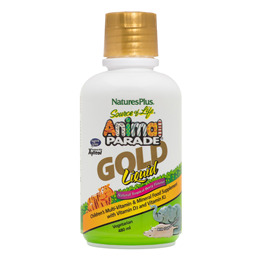 Animal Parade Gold Liquid is a great way to give your kids the nutrition they need and the flavour they crave! The juicy, luscious flavour of original Animal Parade Liquid makes a big splash with kids! Now kids can ride the irresistibly delicious tidal wave of tropical berry flavour in Animal Parade Gold Liquid. Purified Water, thickener (vegetable glycerol), sweetener (xylitol), calcium citrate (supplying 50mg calcium), flavour enhancer (citric acid), ascorbic acid, magnesium citrate (supplying 10mg magnesium), d-alpha tocopheryl acetate, acidity regulator (malic acid [E296]), ferrous gluconate, natural flavours (vanilla, raspberry, cherry), thickener (non-GMO xanthan gum), choline bitartrate, zinc gluconate, niacinamide, lemon peel complex, calcium pantothenate, inositol, beta carotene, manganese gluconate, vitamin A palmitate, biotin, lutein, menaquinone-7, preservatives (sodium benzoate, potassium sorbate), pyridoxine hydrochloride, thiami hydrochloride, riboflavin, sunflower, flax, spirulina, chloecalciferol, chromium picolinate, potassium iodide, Gold Standard Whole Food Blend (acerola extract, apple, broccoli sprout, cauliflower sprout, collard, kale, kale sprout, parsley, beet juice, carrot, spirulina, spinach, tomato juice, bilberry, blueberry, Chlorella vulgaris, cordyceps mushroom, maitake mushroom, shiitake mushroom), brown rice, mango, carrot, West Indian cherry (Malpighia glabra), papaya, sodium selenite, calcium-L-5-methyltetrahydrofolate (10mcg folate) and methylcobalamin. Shake well. As a food supplement for children two years of age and older, take 1/2 capful (15ml) once daily. Mix with a favourite beverage. Do not exceed recommended serving. Not a substitute for a varied diet. Suitable for adults. 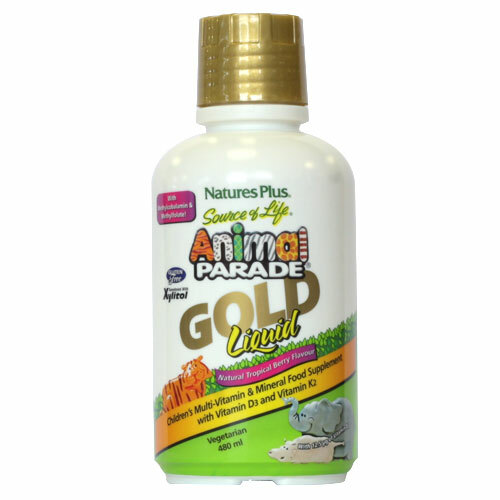 Below are reviews of Nature`s Plus Animal Parade Gold Liquid - 480ml by bodykind customers. If you have tried this product we'd love to hear what you think so please leave a review. baby loves it. Ok she is 2 but she still loves it and it has everything. So I love it too. So glad to have finally found a quality food based supplement that my very fussy eater is happy to take.